Many are calling for dodgeball to be made an Olympic sport. In fact, the Global Association of International Sports Federations (GAISF) granted observer status to this non-traditional sport last fall. But to become part of the games there needs to be proof that dodgeball is a widespread sport. No problem! These are so easy to prove for dodgeball, unlike say, pole dancing, which has also been granted observer status. Dodgeball is the unofficial Olympic sport of workplaces around the world, with tens of millions of people playing every day, sometimes all day. From my observation, women and men are equally skilled and excel with only mild stimulants like bad coffee, looming budget cuts, or a bad financial quarter. The bigger, more bureaucratic and hierarchical the organization, the more likely you are to find people who could easily qualify to be part of a gold medal team. They’ve been training on the job for most of their working lives. They are so outstanding at playing at work that I doubt there will be too many problems with doping. Then again, the Russians might have another view considering their bureaucratic mastery. For those of you who didn’t grow up playing dodgeball in PE class or on the street as I did in Boston, it’s a simple game: two teams try to throw balls at each other while avoiding being hit themselves. The objective is to eliminate everyone on the opposing team by hitting them with balls or catching a ball thrown by someone on the other team. The balls are usually foam or rubber, so you don’t get physically hurt. Lots of running around and a simple strategy: don’t get hit and hit as many on the other team as possible. 1. Dodging the elephants in the room. 3. Dipping under the radar to avoid being asked to change how they work or to replace old systems and processes. 4. Diving for cover when a courageous team mate speaks up to the boss and you would rather seek cover than to be associated with your Rebel friend. 5. Dodging giving – and hearing -- honest and helpful feedback. A dodgeball disadvantage for Rebels at Work? While Rebels at Work are proficient in dodgeball – how could you not be if you’re employed and work with people -- Carmen and I find Rebels are better at playing offense, throwing the ball to get their change resistant colleagues and bosses out. Dodging and ducking, not so much. We call out what no longer works and try not to duck difficult conversations and the general discomfort of change, as difficult as that may be. 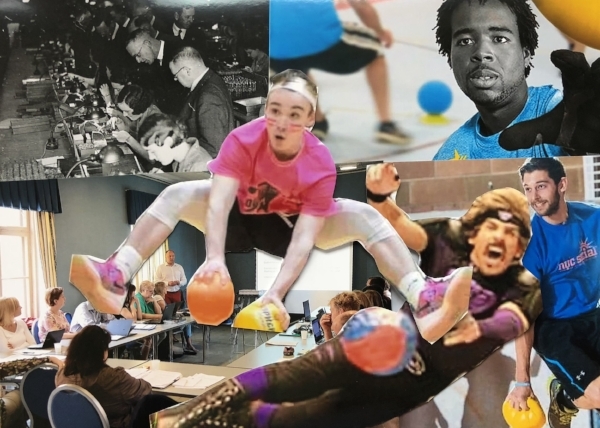 While we’re always trying to support and promote Rebels at Work, I’m afraid we and our friends may not make the cut for the dodgeball Olympic qualifying teams. But I like to fantasize about how much real change we could get done while our stuck-in-the-mud colleagues are off playing at the Olympics. While it may take a while for dodgeball to become an Olympic sport, the 2018 Dodgeball World Cup competition will be held this year in one of the great office and bureaucracy capitals of the world: New York City. Who needs the soft skills? Like good rebels, we calmly acknowledged that there is a need for soft skills if you work with people, and if your work requires you to get support for new projects or introduce new ideas, you need soft skills squared. Then we got to work creating a program that’s like a graduate seminar in organizational dynamics and emotional intelligence, interviewing fascinating experts like Adam Grant, a Wharton School professor and author of Originals: How Non Conformists Move the World, Maria Sirois, a psychologist with deep expertise in positive psychology, Paul Furey, a psychologist who coaches business people in how to have difficult conversations. The single most important “soft skill” to develop? Reduce the anxiety of people you’re talking and working with. Executive coach Maria DeCarvalho on how to deliver difficult messages. The single biggest mistake to avoid? Creating disruption at work. Focus on developing relationships, not disrupting and alienating people. Corporate Rebels United's Peter Vander Awera on learning from setbacks and failures. What to do when the you-know-what hits the fan? Lean on your biggest strengths, and be more of who you are when you’re at your best. Psychologist Maria Sirois on developing optimism and resiliency. How to find the right boss and place to work? When interviewing probe how open the organization is to people who want to introduce to ideas. Specifically ask: What happened to people who brought up unpopular ideas? What questions are off limits? (Ideally, none should be) What’s the biggest problem in this organization that everyone recognizes and no one talks about? Author and Wharton professor Adam Grant on what to look for in managing the relationship with your boss. The amazingly simple way to settle down and not say something stupid when we’re becoming emotional? Say what you’re feeling. When we hear ourselves say what we’re feeling we settle down and become more rationale. Psychologist Paul Furey on managing your emotions and anger. What is the biggest reason so many good ideas never happen? We create solutions to the wrong problems. Maria DeCarvalho walks through the Immunity to Change framework, which helps diagnose the real problem in an organization. What would happen if there were no rebels and change agents at work? Insanity. Art of Hosting master facilitator Tenneson Woolf in the Parting Shots video, a free segment with some “best of” advice. Who needs to improve their soft skills? All of us. p.s. – A recent study in the U.K. found that soft skills are worth £88bn to the UK economy. According to Neil Carberry, director for employment and skills for the Confederation of British Industry, "Business is clear that developing the right attitudes and attributes in people - such as resilience, respect, enthusiasm and creativity - is just as important as academic or technical skills. Learn more about the Be a Brave, Big-Hearted Rebel video program here.